Anyone remembered the Rilakkuma Ichiban Kaiji Part 29 Sure Win Lucky Dip that I had posted more than three months ago? I gave in to temptation and bought more of the cards, winning myself yet another tumbler and 2 sets of magnet. Am so happy with my winnings. Take a look at the two beautiful tumblers that I had won for myself. Am so grateful to the seller for being so nice in allowing buyers to choose between the two designs. I was lucky to have won two. If not, I would have a difficuit time trying to make up my mind which one to get. The tumbler is quite big and can easily carry 750ml of water. I’ve taken a picture of the size of the tumbler as compare to my portable charger. Have started using the pink tumbler and still thinking what to do with the red one? Anyone wanna buy it from me? Hehez!!! Next up is the three sets of magnet that I had won. I must apologise that my lousy camera is not doing any justice to the magnets sets at all. It fails to bring out the glitterness of these awesome magnets. I choose two sets of the one design and one from another design. Sold one set to an old friend who is a big fan of Rilakkuma, just like me. The special giveaway still applies. For every five draw card that you had purchased from our sister partner, Rilakkuma Preorder, you can get to claim a mystery goodie bag containing skincare and facial goodies worth at least S$30. And the first five friends who claimed the bag from me, will find a retail size product inside their mystery bag. Took part in Pu Niao’s blog giveaway and was very lucky to have won for myself the Block up kids SPF30 spray. It comes really in time as my sunblock lotion is about to run out. And even more thankful to her for bringing the prize all the way to me at my workplace. Got a very big surprise when she handed me a small carrier bag loaded to the brim with my prize and other goodies. I was kinda grinning from ear to ear when I saw the bag. I love to read her blog for her review and also updates on where to get various free samples. She is one of my favourite blogger and she is also one of those that inspires me to start my own blog. OMG! Just look at the huge quantity of items that she had packed into the bag. She remembered my love for Body shop shower gels. Wait… And also the Sulwhasoo soap that I’ve been trying to get my hands on but failed. I’m so going to prepare a goodie bag for her in return too. She is such an angel. Many weeks had passed since I last clear my mailbox. I never expect to see it accumulated by such a considerable amount during my absence. Shall start to clear them bit by bit, as and when I got free time on hand. Let me see the first two mail that I had opened up. First up is the coffee sample from Brooks that I had signed up via their facebook page. Not sure how long ago was that. Think I kinda lost count of time. But nevertheless, am happy to finally received the samples. Am so looking forward to trying them out. Which one should I try first? There is still a mountain high of letter and parcels that I need to clear. Times is really not enough. Will try to clear a few daily. Till then, I’ll be off to bed. Need to wake up very early tomorrow. Au revoir! I participated in the Secret Santa Gift Exchange organised at my workplace a week ago. It was very sweet of my company to organised such a lovely event. Not to mentioned, delicious foods were also provided. I would have truly enjoyed myself if not for a SUPER inconsiderate and selfish person who totally spoilt my day. Even til now, that person had not show any sign of remorse nor apologise to me. My present from my secret santa. I’m so loving it. Am kinda scared that I might received something that does not suit me. Or maybe something that I already had. But guess I worry too much. My secret santa really know my likings. Am so looking forward to completing the patchwork when I got some free time. 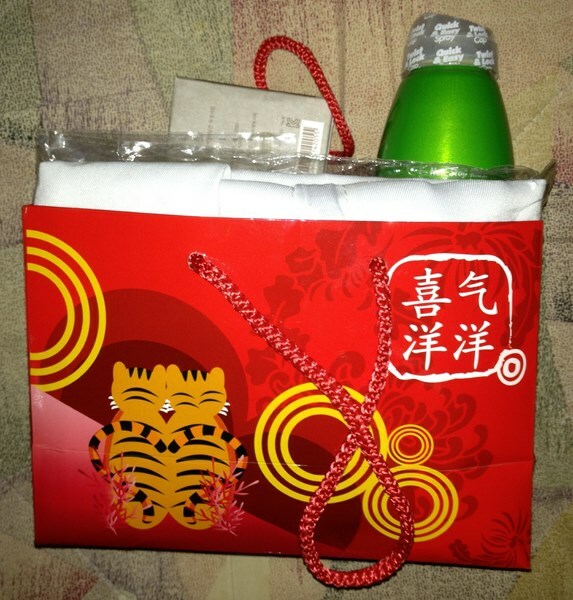 Besides my secret santa, my company also joined in the fun by giving everyone a secret gift via lucky draw. After dipping my hands into the pot, I pull out a piece of paper, with number 5 printed on it. Thought the content to bee of tote bag since the gift bag feels kinda fluffy to me. But after opening the package and tearing through layers of newspaper, I was so overwhelmed with joy with my prize. Its a camera. Hooray! I’ve been eyeing it for long but did not buy cos I bear not part with the money. Yup! I know! I admit it myself! I’m a miser! I’m so happy. Should I start using it now or use it during CNY?